In Prometheus, the popular science fiction film directed by Ridley Scott, a team of scientists from Earth lead an expedition into a cave system on an alien planet. Instead of exploring this subterranean network themselves — a dangerous and time-consuming activity — they deploy drones to generate 3D maps of the cave system, allowing them to assess the environment from the relative safety of the main cavern (spoiler alert: it doesn’t stay safe for long). Now, imagine if we were able to use this same technology to make subterranean rescue missions safer for first responders, or to map out underground mines from safely above ground. Whether on Earth, or on a distant fictional world, subterranean environments — from human-made tunnels, urban underground spaces and natural cave networks — are often inaccessible and dangerous to humans. 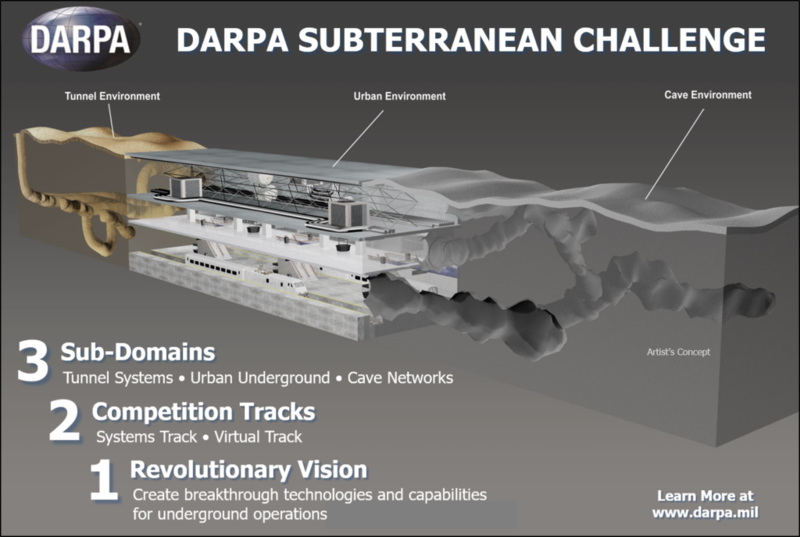 The US’ Defense Advanced Research Projects Agency (DARPA) has launched the Subterranean (SubT) Challenge which aims to explore new approaches to rapidly map, navigate, and search underground environments. Our world-leading Robotics and Autonomous Systems group, part of Data61, is one of seven teams to receive up to US$4.5 million in funding from DARPA to compete in the SubT Challenge. The DARPA Subterranean Challenge explores innovative approaches and new technologies to rapidly map, navigate, and search complex underground environments. – Image courtesy of DARPA. Our roboticists have decades of experience in developing robots, sensing and communications systems for challenging environments like underground mines, and caves. We’ve assembled a team of nearly 30 people from our Robotics and Autonomous Systems research group, students from QUT and the University of Queensland as well as funded partners including the Georgia Institute of Technology. Our SubT Challenge team will create 3D maps of underground environments through LiDAR (Light Detection and Ranging) scanners mounted on legged robots as well as unmanned aerial vehicles which can fly in GPS-denied environments without a human controller using our Hovermap technology. 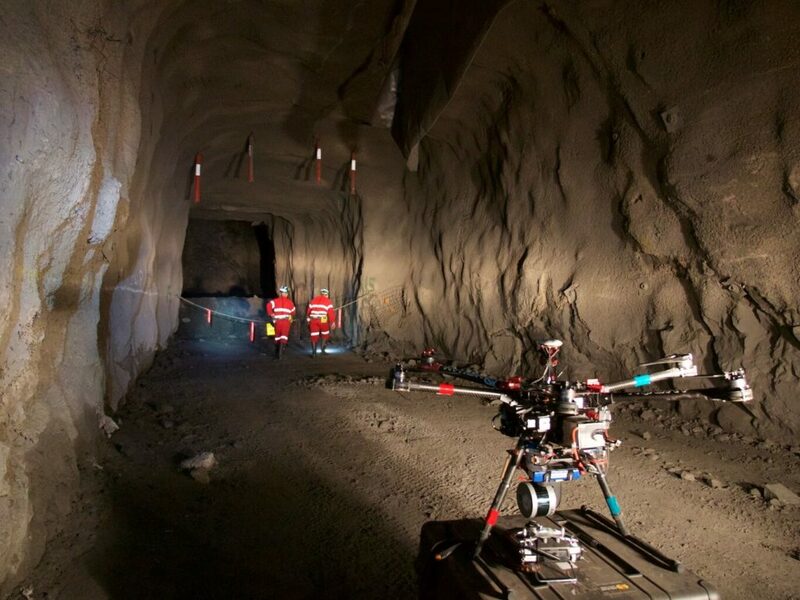 Just last year, Hovermap completed the world’s first fully autonomous beyond line-of-sight drone flight in an underground mine, 600 metres below the surface in Western Australia. Our legged robots are modelled off insects and are designed to negotiate uneven terrain easily. In fact we’ve recently deployed one of our six-legged robots to navigate autonomously in the Amazon rainforest, as part of a project to protect biodiversity using data. Our Hovermap drone technology can operate in GPS-denied environments, like mines, without a human controller. “By combining our ultralight legged robots with Hovermap GPS-denied drone autonomy technology, we’ll be creating a robot team that can rapidly explore and map challenging underground environments, providing unprecedented situational awareness in time-critical scenarios such as disaster response,” Mr Fred Pauling, Robotics and Autonomous Systems group leader at CSIRO’s Data61, said. Once developed, this robotics and network technology can also be applied across a range of industries including mining, transport, building and construction and agriculture. Robots like our hexapods and Hovermap can help us explore dangerous and inaccessible spaces. Have you met the rest of our robot family? Yet another world -leading CSIRO effort. Good luck with the challenge competition – though as my father was fond of saying, “we rely more on skill. ” Please update us after the event .